Ren, rymliga, Gated Community, gratis WiFi. Fantastiskt läge, så nära WALT DISNEY !! Två sovrum, vacker och elegant inredda, luftkonditionerade lägenhet har en egen privat skärmad-i Balkong, fullt möblerade, professionellt rengjorda och redo för din omedelbara njutning. Rökfritt och Pet Gratis Unit. Vi ställs tillbaka utanför en stor landsväg i en lugn, fridfull indelning för din semester avkoppling och njutning. Allt du behöver för att njuta fullt ut av din vistelse. En full service kök med diskmaskin, full storlek tvättmaskin n'dryer, pool, sängkläder på sängen, handdukar i badrummet, etc. Eventuella frågor eller funderingar du kommer att kunna nå de husägare direkt. Kom och njut av vårt hem som om det var din egen! Nyckelord: sovplatser 4 till 6 personer - Disney World parker, Hollywood Studios, Magic Kingdom, Epcot, Animal Kingdom, Blizzard Beach, Disney Quest, Typhoon Lagoon, etc. Disney Springs / Cirque du Soleil, AMC biografer är ca. 15 minuters bilresa bort. Universal Studios / Islands of Adventure, Sea World / Discovery Cove, International Drive / Wet & Wild Water & Orange County Convention Center en 15-20 minuters bilresa från Disney SunLake Complex. Florida Mall / Mall at Millenia / Premium Outlets cirka 20-25 minuter. Orlando International Airport ligger cirka 25 minuters bilresa från vår lägenhet, nära Disney World. Busch Gardens om en 45 minuters bilresa. 1 tim 15 min till Cocoa Beach. Clearwater Beach cirka 1 ½ timme bort. Tampa Aquarium 1 hr-enheten. Lego Land Park Cypress Gardens, FL, 48 minuter bort. Daytona Beach är en om en 1 timme 12 minuter med bil. Njut av närheten av att få till alla Disneys tema och vattenparker !! Många restauranger inom gångavstånd. Och golfbanor, mycket nära med. This was a lovely condo and located so close to the Sisney parks! This condo was very spacious and had all the basics we could possibly need! We even managed to spend a day at the pool to rest! Will definitely keep this unit in mind for future Disney vacations! Thanks! Very clean and comfortable! 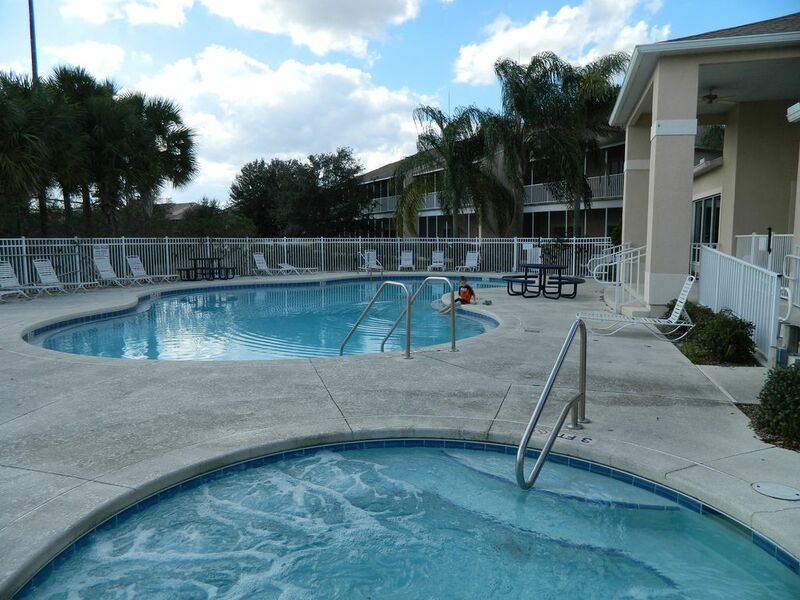 Within 15 minute drive to Disney and lots of shops and restaurants within walking distance. Enjoyed it! Excellent location to all parks, grocery stores and restaurants. Accommodations were clean, comfortable and quiet. Distance to pool and fitness facility was perfect. Nadia was very prompt in answering any questions. Would definitely stay here again. This unit seems newly renovated. It is clean, quiet and close to all your Disney needs. We were also able to walk to the store and restaurants. We will definitely stay here instead of Disney in the future. We were very pleased with this condo for our trip to Disney World. Very clean and spacious. The location and proximity to the Disney parks was probably the best part. This was our first time actually driving to the parks and we had a great experience. Would definitely stay again. The only negative was the beds were a little too hard. This wouldn't stop me from booking this condo again. Great location, clean home away from home. The king bed was a little too firm for us but that is the only negative. Highly recommend location, not far from parks and very close to restaurants. 3 minuters bilresa till Disney exit. Magic Kingdom, Epcot, Animal Kingdom, Hollywood Studios, Sea World, Universal, Legoland och gångavstånd till många restauranger, nära många bra affärer / butiker och köpcentra.